Cartoon reproduced by permission. To see more of Connie Sun’s work, go to http://www.conniewonnie.com/ or follow her on Instagram https://www.instagram.com/cartoonconnie/. Bless the Catalonians who voted to split from Spain. Bless the nation that wants to keep them. Bless the Kurds who voted for independence from Iraq. Bless the Iraqis who fight the Islamic State beside them. Bless the ceasefire in Colombia with the Marxist National Liberation Army rebels. Bless the dreams of every homeland. Bless the victims of the mass shooting in Las Vegas, Nevada, U.S.
Bless the dead after a stampede on a footbridge at a Mumbai, India, railway station. Bless children and teachers lost when a day care center in Brazil was set on fire by a guard who worked there. Bless the troubled. Bless the injured. Bless the memories of all survivors. Bless the more than 150,000 from Bali, Indonesia, who are in limbo, waiting to see when and if it will be safe to return to their homes near a possibly soon-erupting volcano. Bless the lives lived out in makeshift refugee camps around the world. Bless the Rohingya who have fled Myanmar for Bangladesh. Bless the devastated U.S. territory of Puerto Rico. Bless the hope. Bless the rebuilding. Bless the new homes and, someday, those returning. Bless all in Yemen, where cholera cases could hit a million by the end of the year. Bless the government health officials, World Health Organization, aid agencies and private donors from around the world, now meeting in France to commit to preventing 90% of cholera deaths by 2030. Bless the 1.2 million “food insecure” in Sri Lanka, where drought has led to the loss of two successive harvests, many small farmers have resorted to eating seed saved to plant next season, and many households are eating just one meal a day. Bless the hungry. Bless the hurting. Bless the fear-filled. Bless the aid-workers. Bless the donors. Bless the researchers. Bless the prayer-supporters. Bless the birthdays. Bless new lovers and years-long friendships. Bless the sunsets and the rainbows. Bless the achievements, large and small. Bless the learners and the doers. Bless the meals eaten, alone and those together. Bless each hour of rest and slumber. It will certainly be like this. On this we can depend. Compassionate and loving God, as we watch events unfold across our world, our emotions often cannot be translated into words. So we call out to You with a word You gave us through Your holy Word and on the lips of Your Word made flesh: “Amen”. Amen, we say, at once pleading, celebrating, and hoping for the coming of Your kingdom into our world of laughter and tears, fear and faith. Amen! On this we can depend. Amen! May it be so. Amen! It will certainly be like this. Hear the amens of our lips and our hearts this day and always, O God. Bring reassurance to those who plead, joy to those who celebrate, and comfort to those who mourn. In faithfulness to Your promise to hear our prayers, bring us help and hope as we cry, sing, shout, and pray without ceasing, in the name of Your Son, Jesus Christ. chance to hear that answer. Even as the lawyer questioned Jesus, gracious and loving and welcoming God, we come before you asking that same question: “Who is my neighbor?” And even as the answer was not easy for that man to hear, so it is not easy for many of us, as we look around our world with eyes and hearts filled with fear, thinking of the suicide bomber at the Afghan Supreme Court in Kabul, Afghanistan, who killed 20 and wounded more than 40; thinking of the more than 13,000 civilians who have been hanged by the Syrian government for daring to oppose the government; thinking of the move by the Israeli government to legalize thousands of settler homes on Palestinian land in the occupied West Bank, displacing the residents already there and presenting an obstacle to the peace process; thinking of the countless immigrants and refugees struggling to reach places of safety and hope. Open our minds and hearts, O God, that we may love our neighbors as ourselves, recognizing everyone as our neighbor. Even as some within our world, within our societies, deny the reality of the changing climate, and deny the need to protect the environment, our call to love our neighbor means that we pray today for the Standing Rock Tribe in North Dakota, U.S., as the U.S. Army is about to give permission for the Dakota Access pipeline, despite protests in which nearly 700 have been arrested. We pray for the Saiga antelope in Mongolia, which is being wiped out by an uncontrolled virus that threatens the entire antelope population. We pray for those affected by the tornadoes which have swept through Louisiana, U.S., causing widespread damage in New Orleans East, injuring 20 and severely damaging more than 60 homes and businesses. We pray for those buried by the avalanche in North Nuristan Province in Afghanistan, where at least 120 are dead and scores more are missing, even as rescue workers try valiantly to save the survivors. With that long-ago lawyer, we can so easily lose sight of the reality of our connectedness to one another, even those with whom we differ, even those whom we never see. And so, today, we pray for all those in the United States concerned about women’s health and reproductive rights; we pray for the healthcare workers in Caracas, Venezuela, who are protesting to demand government action for improved health care in that country, as hospitals are in crisis, medications and equipment are scarce, staffing is insufficient, and people are suffering; we pray for the people of Somalia, as they face a contentious presidential election on the rocky road to democracy. But even into those places where we hide in our fear and confusion, you come, Divine Light, filling our awareness with hope. And so we pray in thanksgiving for the people of Colombia as their government begins peace talks with rebels in a bid to end a five-decade conflict that has killed hundreds of thousands of people. We pray in thanksgiving for Australia, as they mark 50 years without executions. And we pray with thanksgiving for the doctors and researchers who are pioneering the use of lasers in removing brain cancer. All of these people and places that fill our prayers we entrust into your gracious and loving hands, God of welcome and inclusion – even as we are ever mindful that we do not love you with our whole heart, soul, strength, and mind, nor do we love our neighbors as ourselves. This, we confess; for this, we ask forgiveness, living in the assurance of your grace. Whose blood set us free to be people of God. And honor and blessing and glory are his. And with these words in mind this day, we pray to the God of Love, the God of relationship, the God of community- Creator, Son, and Living Spirit. God, our creator, guide us in truth and love. As the Mosul offensive rages in Syria, we rejoice in the 50 villages which have been freed from the control of ISIL, but we grieve for the millions of refugees who have lost their homes, their families, their livelihoods, and some, their lives, in the search for peace. Together, we grieve for the families and friends of the 13 dead and more than two dozen injured in the crash of a tour bus in California, USA. Even as authorities seek for answers, guide them in the path of truth. As protests continue at the Dakota Access Pipeline in North Dakota, USA, we grieve with the 27 peaceful activists arrested on October 10th, as they supported the Standing Rock Sioux who believe that the pipeline will taint their water supplies and encroach on tribal burial sites. Fill us with the daring and commitment to support and honor indigenous peoples where we are and throughout the world. As the people of the United States are in the final days of the presidential campaign, we pray for a nation that is deeply divided. May they act and vote out of love, mercy, and justice rather than out of arrogance or hatred or fear. Justice-Seeking God, grant to all of your children in every nation, especially Syria, Burundi, Colombia, Great Britain, Greece, Russia, China, and the USA, leaders and policymakers who can ensure equality and justice through equitable taxes, jobs which pay a living wage, and who refuse to resort to war instead of diplomacy. Peace-Bringing God, we pray for the vulnerable in Somalia, Eritrea, Mexico, Venezuela, and throughout your world where violence and corruption destroy and devastate lives. Forgive us, and call us to account where for the sake of economic advantage in the name of “free trade” we sell arms to governments and groups who abuse their own citizens. Justice-Seeking God, help light and truth to illuminate various trade agreements being negotiated in secret such as TTIP and CETA between the US, Canada and Europe which would give international companies the right to sue sovereign governments to advance corporate interests while having the power to force national institutions to purchase their goods and services even when not in the interests of the country and its citizens. In our zeal to defend our own positions, to prove ourselves “right”, help us to never lose sight of the reality that each person we encounter is a child of your own making, regardless of race, ethnicity, creed, economic situation, sexuality, or age. May we see in the faces of those around us and across this globe your own face, filled with love and hope, mercy and peace. that knew every creature in advance. in that same human form, all summed up. that has thus animated the human being. In the emerging hope for peace in Colombia, where FARC rebels have released a group of child soldiers and have promised to discontinue recruitment of children. In acts of terrorism designed to spread fear and perpetuate extremism in Minto, Australia; Shikarpur, Pakistan; and around the globe. Forgive us for abandoning our primary identity as your beloved children. Bring hope and healing to our broken world. Give us strength and inspiration to look into the faces of our neighbors and see what you see: A glimpse of all your works, a glimpse of you. Note: Many Christians celebrate the feast of St Hildegard of Bingen on 17 September. Hildegard was a Benedictine nun and Christian mystic, writer, and composer in 10th century Germany. because they had turned against you and worshiped other gods. Remember how Moses called you to account? to Abraham, Isaac, and Israel? Remember…that you remembered. And changed your mind. Remind us too, O God, of all the promises of faithfulness we have made to one another. let those memories outweigh all the ways we have turned against one another. Make us into your own image, O God. but, like you, of faithfulness promised from age to age. In an ancient time, our spiritual forebears were conquered and exiled. And the prophet Jeremiah wrote them a letter about how to deal with their calamities. In the various spirits with which those banished people listened to his letter read out, we open ourselves to you in prayer, O God. Can we take strength from Jeremiah’s letter to welcome the agreement this week of a definitive cease-fire between the Colombian government and the FARC rebels? Can we move beyond our fear that any agreement after such a long time of conflict must be uncertain? God, we pray for the strength to do that. We pray for long memories to remind us that the glamour of war never lasts and leaves too many casualties by the side of its road. We pray for vision that trusts your plans for each of us and for all your children, plans of hope and a future. Can we take hope from Jeremiah’s letter to celebrate the opening of a bridge across the Bosphorus Strait in Turkey? Representatives from countries that have struggled long and hard through generations to achieve independence and respect, countries like Bosnia and Herzegovina, Macedonia, Bahrain, Northern Cyprus, Serbia, Georgia, and Azerbaijan, all lent their prestige to the opening of the bridge. We pray for blessings of peace and mutual understanding. We pray that ancient wrongs that face each other from one end of the bridge to the other may be overcome, if not forgiven. We pray that those who have not experienced those particular wrongs may learn to understand how deeply felt and remembered they are. We pray with Jeremiah and Jeremiah’s audience for the peace of Jarabulus, Syria and the conflict areas along the border between Syria and Turkey. There are reports of dozens of civilians killed, more wounded, and thousands in flight from their homes and their villages. We pray, Lord, for the wisdom that you impart. Teach us to pray for peace and prosperity for all. As the funeral bells complete their tolling in parts of Italy stricken by earthquake, we pray for courage and restoration of community. For the loss of life in Amatrice, Accumoli, and Pescara del Tronto, we mourn. For the individuals and their communities from the countries of Italy, Romania, the United Kingdom, the United States, Albania, El Salvador, Canada, Spain, and Macedonia already named among the casualties, we mourn. For the world and its loss of cultural heritage, we mourn. It is an awesome natural world in which we live, and we pray for that wisdom from on high that would make it safe. We are learning about a planet that we are told is in a “habitable zone” around the star closest to our sun. Our minds do not really work with distances of light years; the 4+ light years between our sun and the closest star amount to 25 trillion miles. Yet the ingenuity of scientists and technicians is such that we know that somehow your plans for us include a richer understanding of our own planet and of our own universe. We pray for an endless residence in a house of wonder at this glorious creation in which we live out our days. Dear loving God, who so well understands that we scarcely know our own plans for ourselves and who yet shares a loving purpose and destiny with us, hear our prayers. Amen. God of the seasons, we thank you for summer. You surround us with evidence of revival, eternal life, abundance, resurrection in every field, every garden, every flower bed, every forest, every vacation spot and swimming hole. are sent from heaven above! 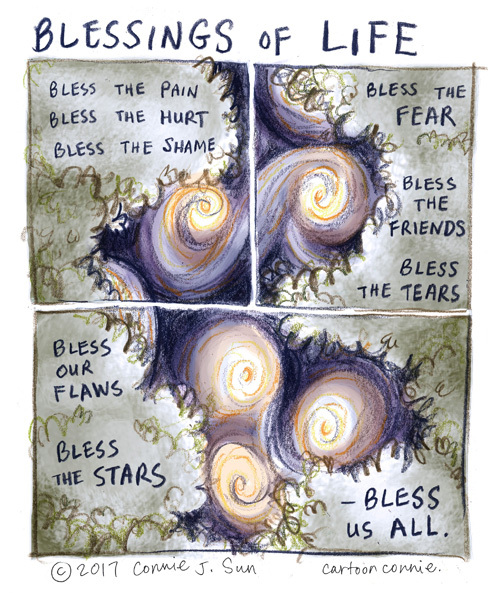 We acknowledge the gifts, we offer the thanks, we bask in the love. Our delight is sharpened by our halting awareness that summer’s sorrows are equally real. The mysteries and vagaries of weather, the strength of agriculture, the upheavals of society, the cries of injustice, and the wounds of war threaten idyllic summer reverie. Even the inequalities of summer’s gifts give us pause. For some there is no break, no bounty, no beach reading, no abundance of crops, no relief, no freedom, no rest, no peace. As we enjoy this summer season, may our spirits be fertile ground for Your seeds to take root, so that we can grow in compassion, commitment, and deeds worthy of Your name. The Australian government has passed a law preventing medical personnel caring for refugee immigrants imprisoned on Nauru from discussing or disclosing the physical and mental problems they are encountering even among children. Inhumane conditions and procedures are routine including removal of medicine and medical equipment from the refugees. But there are peace talks between FARC (Revolutionary Armed Forces of Colombia—People’s Army) and the Colombian government after more than 50 years of brutal civil war. We celebrate the courage and determination being shown by primarily Democratic members of the House of Representatives in the United States demanding the chance to vote on legislation for increased gun control. The horror of the lives lost needlessly through the ready access to guns massively outweighs any deaths from terrorism. Lord, help us to realize that lives are more important than weapons. May justice and peace prevail over self-interest and self-absorption in the pseudo-machismo so often associated with powerful weapons. Teach us to be men and women as you envisage and created us to be, without the need for force and fear perpetrated on others often innocent or vulnerable. Lord, may justice and peace and right living in harmony with one another become not merely a wish but a reality, now. In the UK people are being urged and inspired to reject hate and work together for a better community, building on what unites rather than divides us thereby providing a legacy of the murdered M.P. Jo Cox. We give thanks for the generous giving of over a £1.5 million (approx..$2 million USD) in memory of Jo Cox to help those lonely and marginalized in the UK, Syria, and to provide humanitarian aid which will change lives. Lord, bless and magnify this life-giving expression of love and care and all such efforts wherever they exist. My heart breaks when I read and see the news and sometimes I can’t bear it and howl from the depths of my being in pain, anger, and disbelief at what we humans can do to each other. Open our eyes Lord, open our ears so that we hear not just with our physical sense but from all that you have given us, to the cries and pleas of our brothers and sisters. Shake us from our blind complacency that what is convenient and cheap for us often comes at extremely high cost to others working for pence in conditions that would never be tolerated in our own countries. Remind us that we are all inextricably bound to one another wherever we live on this planet – when crops cannot accommodate the changes in temperatures and oceans continue to be polluted and ravished for whatever we think would make our lives or tables more comfortable. Lord, open our eyes to our sinfulness – all that separates us from you and your heart and will. We give thanks for the peacemakers, whether it is on the big scale like Colombian President Juan Manuel Santos, or all those working quietly in their own communities on small projects to bring disparate and hostile and often fearful groups together. We give thanks for imaginative projects like the Israel Clown School bringing together Jewish and Muslim youngsters. Help us to think outside the box, so that peace, justice, love, and hope can reign on earth as it is in heaven.